Researchers from Harvard University and Boston Children’s Hospital have developed an innovative robotic sleeve that fits around the heart like a glove, maintaining a steady beat while the patient recovers. As described in the latest edition of Science Translational Medicine, the robotic sleeve could open up new treatment options for people who have suffered a cardiac arrest, keeping them alive before a transplant, or to aid in cardiac rehab and recovery. The customizable device is designed to wrap around the heart, contracting and expanding in synch with its beating. Today, some of the methods used to treat heart failure include mechanical pumps called ventricular assist devices (VADs), which pump blood from the ventricles (each of the two main chambers of the heart) into the aorta (the main artery of the body). Unfortunately, these devices come into contact with the patient’s blood, increasing the risk for blood clots and strokes. For this reason, they typically require patients to take blood thinners, which can be dangerous. The new device, a collaborative effort between Harvard’s School of Engineering and Applied Sciences (SEAS), the Wyss Institute, and Boston Children’s Hospital, overcomes this problem by avoiding direct contact with blood. To build it, the researchers took inspiration from the heart itself. 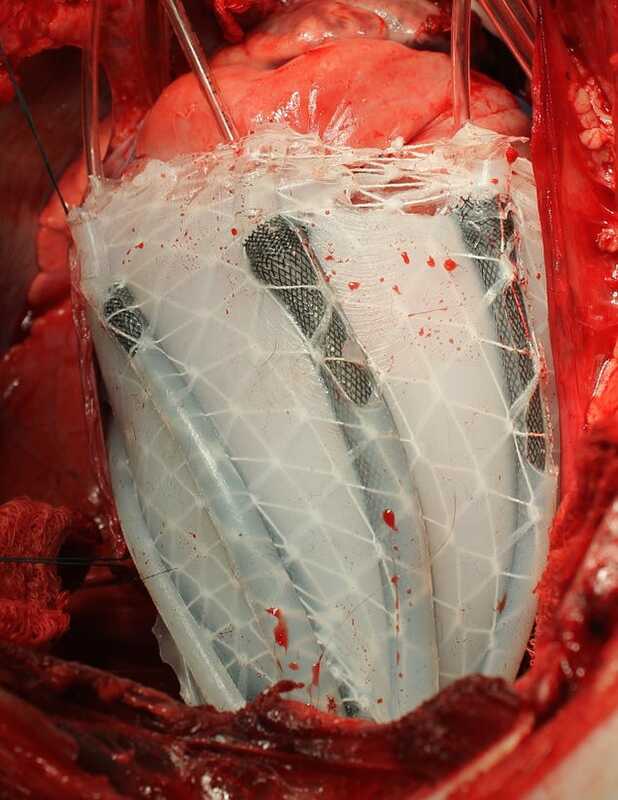 The thin silicone sleeve is equipped with air-driven (pneumatic) actuators, which are placed around the heart to mimic its outer muscular layers. To attach the heart, surgeons use a suction device, sutures, and a gel to help with any friction. An external air pump is used to power the actuators. To give the heart an assist, the sleeve twists and compresses the organ in similar motion to a beating heart. This device is a very temporary, emergency measure, what the researchers call a “bridge.” Because it requires pressurised air, patients would have to stay near a pump while they’re using it. That said, the researchers are hopeful that a compressed air supply could be stored in something like a backpack, making the system portable. The sleeve can be customised for each patient. So, if the patient has more weakness on the left side of the heart, the actuators can be adjusted to offer more assistance on that side. Also, the pressure of the sleeve can be increased or decreased over time to match the patient’s changing medical needs.